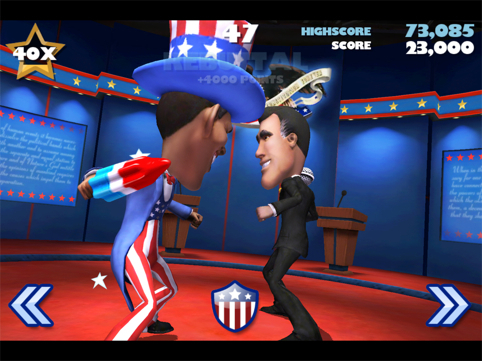 It's Democrats versus Republicans in this outrageous fighter from the talented developer behind Infinity Blade. It's been a while since we've heard from Infinity Blade developer Chair Entertainment, at least when it comes to new projects. We can only imagine the studio is hard at work on Infinity Blade 3, or busy cooking up some more downloadable content for Infinity Blade 2. Perhaps, but for now, the company just put the finishing touches on a different kind of fighting game titled VOTE!!! 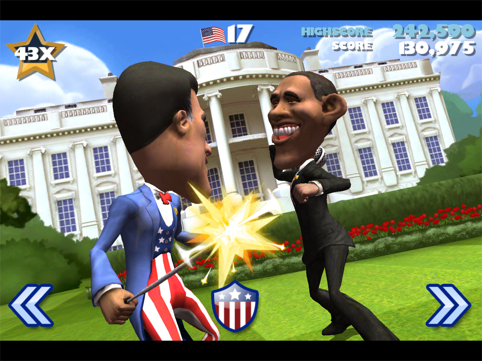 The Game, where President Barack Obama And Mitt Romney throw down in a brutal bid for the White House. Yes, you read correctly. 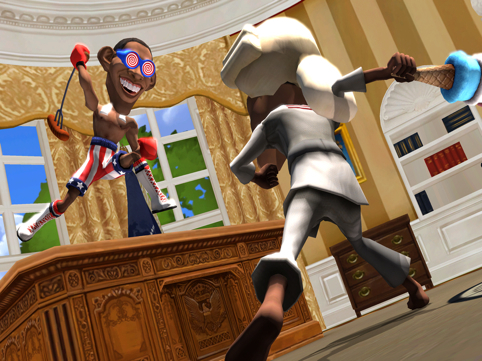 It's a 3D brawler where both the POTUS and the hopeful candidate lay the smack down on each other on the White House lawn and even inside the Oval Office. Players can switch costumes, select different items to put in their hands and even make use of perks, like Health Care (can't be knocked down) and Super Pac (double your points). As they brawl, players collect votes, and the number gets tallied nationwide. More importantly, Chair and publisher Epic Games partnered with Rock the Vote to help promote the upcoming election. "VOTE!!! is everything a great game should be: challenging, rewarding, super fun, and players will find themselves laughing the entire time," said Donald Mustard, Creative Director, ChAIR Entertainment. "We're excited to join forces with Rock the Vote to help emphasize the importance of voter registration and encourage gamers to become more involved in the political process." "The gaming community is comprised of passionate, well-informed individuals who have an important voice in our democracy," said Chrissy Faessen, VP of Marketing & Communications, Rock the Vote. "We are really excited to partner with ChAIR and Epic Games to encourage voter registration among gamers, in a completely new and innovative way." Have to admit, we're definitely intrigued. On that note, you can download VOTE!!! The Game for free on iPhone and iPad this Thursday, August 23. VOTE!!! The Game is available as a free download from the App Store and is a universal app. The game is compatible with iPhone 3GS, iPhone 4, iPhone 4S, iPod touch 3 (16GB+), iPod touch 4, iPad, iPad 2, and the new iPad.